Conservative activists Candace Owens and Charlie Kirk were harassed by Antifa protesters while dining out in Philadelphia over the weekend. They shrieked in their faces while they were trying to enjoy breakfast. Christopher Hahn, a liberal pundit, suggested it was all planned. "I’m suspicious of this, whether or not this is real or not," Hahn said on Laura Ingraham's Fox News show. "I’m not saying I know for sure, I don’t. But it’s kind of weird to me." So, while Owens was a guest on Brian Kilmeade's radio show, the two gave Hahn a call to set the record straight. Kilmeade warned Hahn that Owens was pretty "fired up" about his claims, but the liberal commentator doubled down. "I just don’t understand" how anyone from Antifa "would know who Candace is," Hahn wondered. "How would they have picked her out?" That really set Owens off. Antifa, she explained, knows exactly who she and Charlie Kirk are. They show up at all their scheduled events. She also defended her national prominence. She has been pictured with and done joint interviews with Kanye West and was the "the most debated topic nationally for two weeks," to the point that President Trump chimed in, she explained. 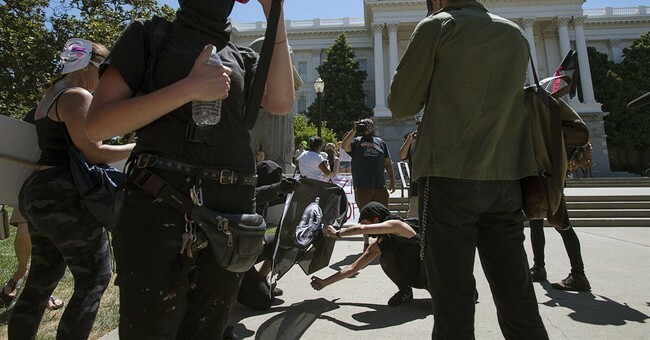 "Every Antifa group knows who we are," she told Hahn. "You’re pleading ignorant here. It's unacceptable." Owens also said Hahn was being "snide and arrogant." But, she wasn't surprised because it’s "typical" of liberals. Several conservative activists, Republican lawmakers and Trump administration officials have been harassed in recent weeks, perhaps the most notable being the instance White House Press Secretary Sarah Huckabee Sanders was forced out of a restaurant in Virginia.